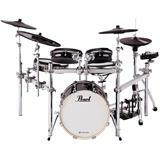 Pearl & Korg combine to set a new standard in the world of e-drumming. "Not just a new standard. 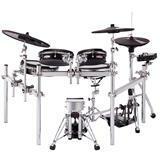 A new sound, a new feel and a complete new e-drumming experience." The tag line of the Pearl e/MERGE powered by KORG says it all. Two legendary brands that worked togheter to create a new standard in the e-drumming world. For years their innovations and achievements lead the market in new directions, to combine these two leaders can only mean one thing: Great things will happen. And with that e/MERGE was born. Simple but elegant in design, the e/MERGE MDL-1 module, with a full librabry of High defenition, natural and organic acoustic Pearl drums combined with KORG's library of electronic and orchestral quality samples percussion sounds it's the start of a big change. Introducing WAVE, a completely new technology (trigger technology), partially based on KORG's legendary WAVE drum. It brings a realism, instantaneous response and dynamic range, never seen before. And then there's the Pearl PUREtouch Pad developed to create a true acoustic-like pad experience, providing the sizes and feel every acoustic drummer expects, completes the experience. Discover this new product and all its elements in our store or online!